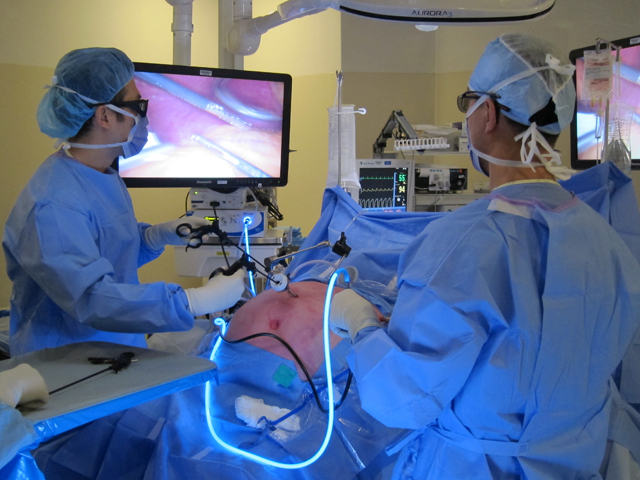 Surgeons in Richmond perform bariatric surgery using new 3D laparoscopic equipment. In October 2013, the Richmond Hospital opened two new operating rooms integrated with 3D laparoscopic technology, a first in Canada. Surgeons can now perform advance minimally invasive surgery with 3D precision. Dr. Sampath, Head of the Department of Surgery at the Richmond Hospital, prefers 3D video over traditional 2D video for more complex laparoscopic cases: “I like the 3D equipment, particularly when there is laparoscopic suturing involved.” 3D technology restores depth perception allowing for improved assessment of the spatial relationship between organs as well as more precise tissue handling. These multipurpose rooms can function in 3D mode (used for general surgery, urology, and gynecology) as well as in 2D mode and open surgery mode with a HD camera built into the light handle. There are also significant benefits for surgeons teaching laparoscopic techniques to surgical residents and fellows.